Why spend dress up for a night out when you can slip on your apron to impress? I have never received a Valentine’s Day card. Another fact is that I have never sent one either. At school the build-up to February 14 was huge; whispers and gossip were rife. Should it be a shop-bought card or homemade, dark or milk chocolates — there were so many decisions to be made. For me it was simple, I just didn’t. This week I’ve been inundated with messages and emails regarding Valentine’s events and staycations. Maybe I’m just cynical, but like many of my single friends, we agree it’s just a reminder that we are single, which I’m totally cool with. A discussion in the office last week was a consensus that many of my colleagues would perhaps go for dinner, maybe exchange gifts — most people’s plans were very low-key. This conversation reminded me of my college days. I used to work for a burger chain (the one with the golden arches), where I came up with the idea of hosting a couple’s evening at the restaurant. My idea was met with a lot of cynicism; I was told it was a ridiculous plan, and no one would come. So the next day I designed a poster advertising my event, and I displayed it in the store. I arrived the following day for my night shift to be informed that bookings had been made. I dressed the tables in red tablecloths, red napkins, plates and cutlery. On the night, I turned down the lights and lit candles to set the mood. As my first guests arrived, I took their orders and showed them to their tables. As the kitchen was preparing the food, I neatly presented the food in plates rather than in foam boxes. Knives and forks were used; eating with your hands would be so unromantic. To my surprise more and more people showed up. I offered all my customers the option of eating their meals in my romantic setting, and many took me up on the offer. The night was a huge success, if not a little tongue-in-cheek. My candlelit event proved that you don’t have to be in a top restaurant to have a romantic meal. I think there is no better way to show love than to cook for someone. Again, it doesn’t have to be all fancy, sometimes simple is better. I love it when friends cook for me. Yes they all say they are nervous because I cook so much, but no one’s here to judge. I will always gift a friend their favourite cake as a birthday gift, or at any other celebration. 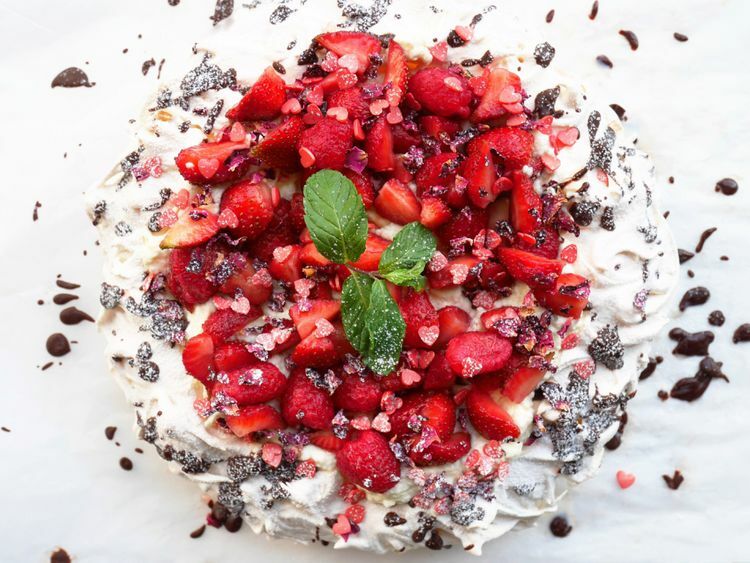 The recipe alongside is the perfect sharing dessert, and it looks delicious. 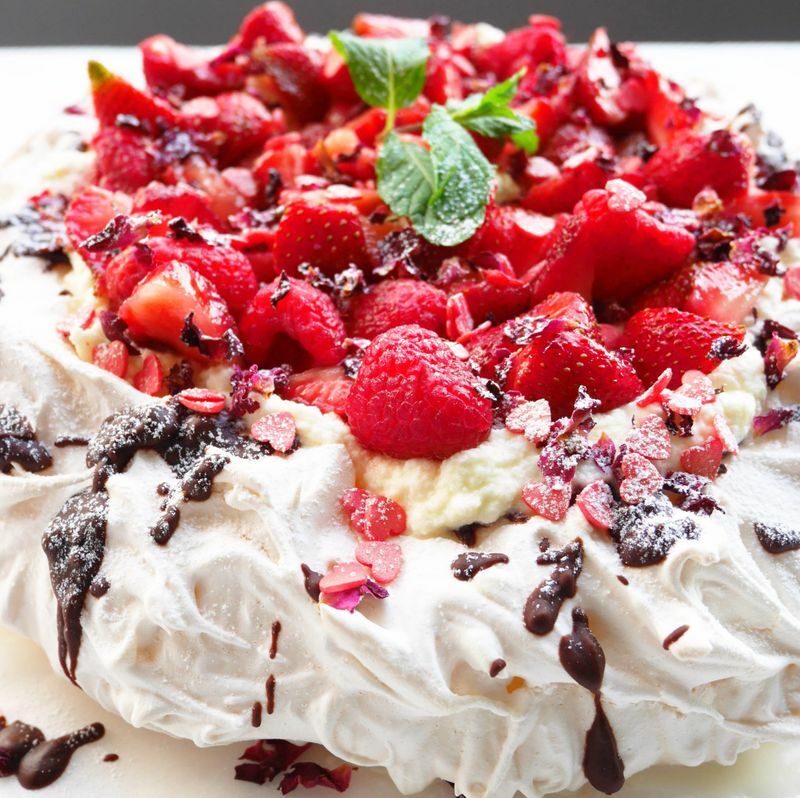 The combination of strawberries and cream was created by Thomas Wolsey, in the court of King Henry VIII. The origin of the fruit’s name remains a mystery. The practice of mulching strawberry plants with straw to protect them from weeds and frost has led to the fruit being associated with straw; there are differing stories on the history of the fruit. Served dipped in dark chocolate or served with fresh cream everyone loves strawberries (actually except me). This recipe can be prepared in advance and assembled just before serving, topped with a mini love heart, what’s not to love? Preheat the oven to 100 degrees Celsius. Separate the eggs and place in a metallic food processor mixing bowl, or hand held mixer, and whisk on medium speed until they are fluffy and form peaks. Now turn the speed up and start to add the caster sugar, a tablespoon, leaving a few seconds in between each spoonful. Next, lower the speed and do the same with the icing sugar. The eggs should now look glossy and silky. Line a baking sheet with baking parchment; using a dinner plate as a template draw a circle. Turn over the sheet and scoop spoonfuls of the mixture on the paper inside the line. Using the back of a spoon form a base, keep adding to the edges until the mixture forms a bowl. Using a chopstick swirl the mixture to combine, and for a solid edge. You can also use the same method to even out the inside. Bake for 1 1/2 hours, and when the edges are crisp, turn off the heat and allow the meringue to cool in the oven. Now prepare the filling: Whisk the cream until thick and place in the fridge. Wash and trim the strawberries, cut them into quarters, place in a bowl with the raspberries and a tablespoon of icing sugar. Over a pan of water put the chocolate in a glass bowl and melt the chocolate squares. When the meringue is completely cool remove from the oven, place on a serving board, and using a spoon drizzle chocolate around the edge. Allow to set. For the filling: layer in the cream, place berries on top, add the candy hearts and dust the top with icing sugar, add a sprig of fresh mint and serve. — Recipes, food styling and photography by Mark Setchfield, follow him on Instagram @gasmarksix.